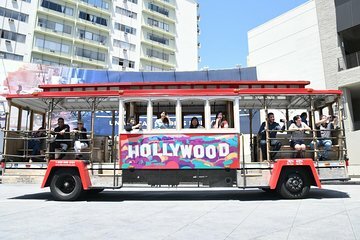 Visite los lugares más interesantes de Hollywood en este recorrido en tranvía de 1 hora por el barrio de Los Angeles que es conocido por su fama y fortuna. Suba al tranvía en el Teatro Chino de TCL y ábrase camino por el cementerio Hollywood Forever Cemetery, el Paseo de la Fama, el cartel de Hollywood, el Hollywood Bowl, los Warner Brothers Studios y los Paramount Studios. Asimismo, pase por la CBS y los 20th Century Fox Studios. Reúnase con su grupo y guía en el Teatro Chino de TCL un poco antes de la hora de salida para comenzar este recorrido de 1 hora por Hollywood. Según su preferencia, el recorrido comenzará a las 9.30 h, 12.30 h, 14.00 h o 15.30 h.
El tranvía al aire libre se abre camino a través de uno de los barrios más populares de Los Ángeles, mientras su guía le informa sobre la zona y su gente. Pase por el Paseo de la Fama de Hollywood y el cementerio Hollywood Forever Cemetery. Realizará una parada breve en el Hollywood Bowl y el cartel de Hollywood, donde podrá hacer unas buenas fotos. Cada parada dura entre 5 y 10 minutos. Continúe hasta observar algunos de los estudios de cine y televisión de la zona como CBS, Warner Brothers, Paramount Studios y 20th Century Fox. Incluso podrá ver el apartamento en el que se rodó Pretty Woman. A medida que su excursión llega a su fin, bájese del tranvía en el Teatro Chino de TCL. Si no lo hizo antes de comenzar la excursión, eche un vistazo a las huellas de los famosos que hay aquí antes de marcharse. I didn't find this to be of much use other than orientating one self to sights and even those not that spectacular. Very interesting and well worth doing.Our driver was entertaining,we had a good weather so that helped. Short but good. No problem picking up tickets. We did not receive this activity as purchased!!!! Tour Operator rushed us through to do the Movie stars homes tour first and then we were sitting on the bus for 20mins waiting for more people before getting underway, so I worried if we had enough time to do the trolley tour after, they assured us we would. WRONG!! when we got back they then told us the trolley tour bus was not running the driver was away!!! (my husband overheard a differant story that it was booked for charter only) ? ?so they then just chucked us on what ever was available, they said it was an upgrade to put us on the Hop on Hop off Bus, but it certainly was not as they only gave us one loop access and the drivers on the double decker buses are shocking DRIVERS and the audio is pre recorded and does not match up with the sights. VERY POOR! I was glad to get off this bus and the drivers still expect tips, & one driver made us get off the bus into traffic because the kerb door wouldn't work! !To add insult to injury we did see the Trolley Bus conducting tours the next day with live audio! This operator needs to pick up their game instead of just doing what they feel like at the time. I would have preferred being booked on Trolley bus at a later time if it was offered. What a fantastic little tour taking to some wonderfull sights and loads of usefull information from tour guide who made it highly entertaining. the tours were great!!! enjoyed them all. Nice quick tour of Hollywood, highlight is you get close to the Hollywood sign, and also stops at the Hollywood Bowl.